We start with the mise en place, of course. For a recipe this simple, I often find it easier to simply build the recipe in the mixing bowl rather than elaborately pre-measuring everything into mise cups, but I always like to make certain that I have enough of the basic ingredients before I get too far into the recipe. 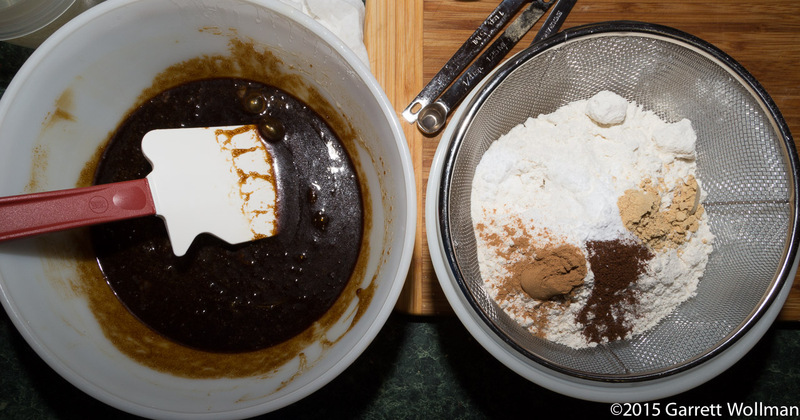 The recipe doesn’t use all that butter (only a stick and a half), but I know two sticks is enough, and likewise the molasses, baking soda, and spices. 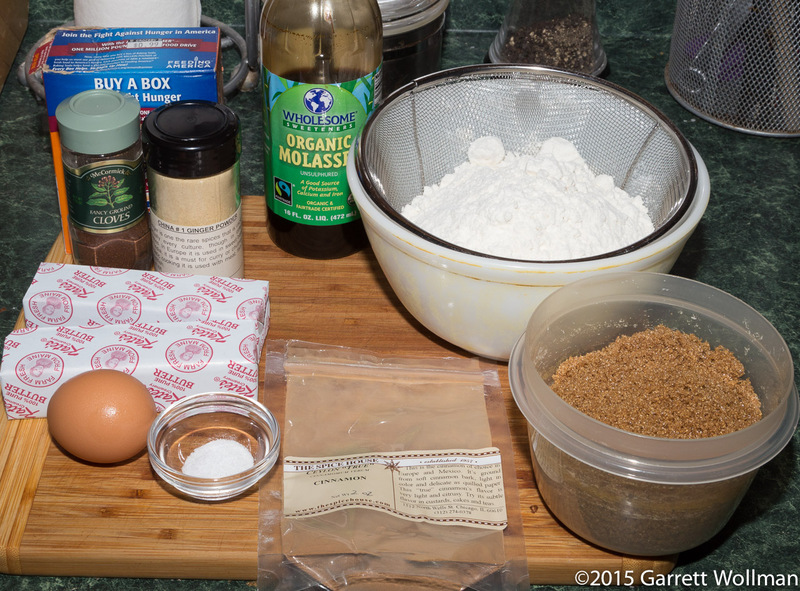 Speaking of spices: I used true cinnamon for this recipe rather than cassia, in keeping with Chang’s preference for subtle spice flavors, although that may be undermined somewhat by the strong China No. 1 powdered ginger. 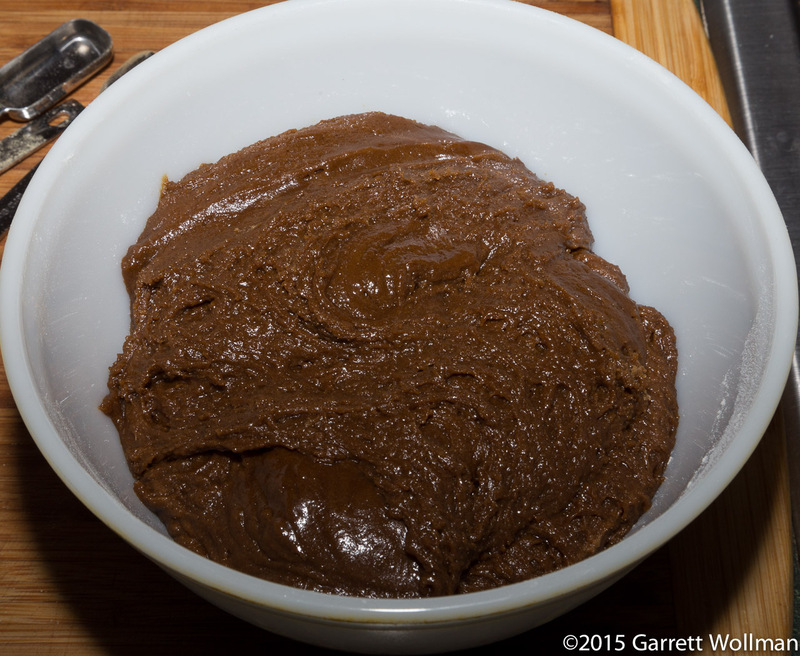 The construction of the dough couldn’t be simpler: melt the butter, let it cool, stir in the sugar, molasses, and egg, and then mix the dry ingredients in. Of course, I’ll sift the dry ingredients together and then use a whisk to ensure they are thoroughly combined before adding them to the wet bowl. Once the dry ingredients are mixed into the wet, the dough is done and ready to be formed — but Chang recommends letting it sit overnight, or up to three days, in the refrigerator, and I saw no reason not to follow that advice, which is now standard for many bakers anyway. So I transferred the dough to a smaller bowl, covered it with plastic wrap, and refrigerated it until the following evening — somehow successfully managing to not eat any of the dough in the interim! I weighed the dough out at this stage, and it came to almost exactly 800 g. (A good thing, too, since that is nearly exactly how much mass went in, and I wasn’t planning on challenging any of the laws of physics in this baking project.) The stated yield of this recipe is 16 cookies, so that worked out almost perfectly: each cookie would start with 50 grams of dough. So on day 2 I took the dough out of the fridge and let it warm up for a while. Chang says to portion the dough a quarter-cup at a time, so I got out my #16 disher. The dough balls are coated in granulated sugar before baking, so I put a quarter-cup of sugar in a small bowl and put the whole thing on my scale, which allowed me to verify my portion sizes. I found that the disher made balls that were about 20% too large — a #20 disher would probably have been closer to the mark, but I settled for only partially filling the scoop and reshaping the dough in my hands before rolling the balls in the sugar. Since my new scale can deal with negative numbers, I was able to work out that each dough ball picked up about 3.5 g of sugar. I laid out the dough balls on two cookie sheets, which I baked, one sheet at a time, for 17 minutes in a 350°F (175°C) oven, turning the sheet around halfway through the cooking time. Hot from the oven, the freshly-baked cookies look like this — I think they’re spread out a bit more than the ones at Flour, but they are have the right crackly top, at any rate. You can see that I’m as lousy as ever at laying things out in straight lines…. 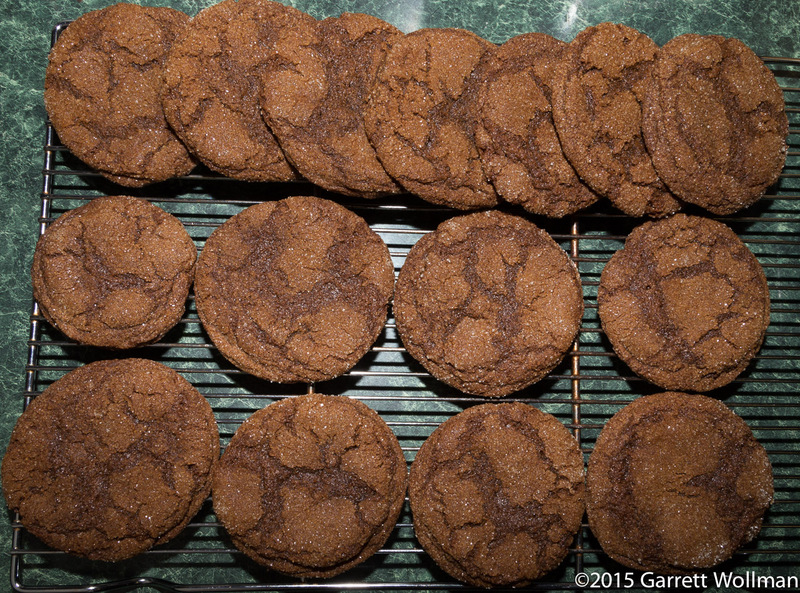 The eagle-eyed will count the cookies on the cooling rack and note that there’s one missing. Did you really think I could or would resist having one for dessert? The remaining 15 will go into the office tomorrow (as I write this) and I’ll probably have one or two more. Luckily, I kept the list of who requested what, so I can make sure they won’t go disappointed even if they go on the staff retreat while I’m in the office advancing. Based on 50 g uncooked dough coated wuth 3.5 g sugar. You could make them smaller by as much as 20% (10 g), which would increase the yield to 20 cookies.